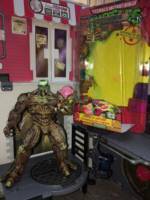 This a is complete custom dry brushed TMNT Krang's Gross Dimension X Body figure. The paints used are acrylic paints with an nice clear finish. Dripping green ooze (Silicone rubber for mold making). The package is a modified Unbranded Robot package. I made the artwork using original vintage TMNT packaging and the original concept design illustartion. Originally Krang’s Gross Dimension X Body was a rejected concept design from 1990 (by Dan Berger and Steven Murphy from Mirage Studios) of a toy presented to Playmates Toys for consideration of a new action figure. 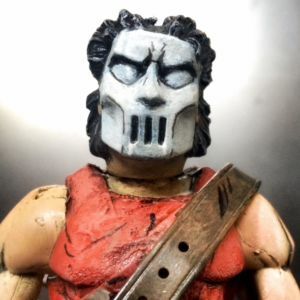 27 years later he is alive and kicking as a custom action figure! Watch out Raph and Mike!